Fun and balanced Pilates workouts for people with osteoporosis or osteopenia. This DVD will help build bone density while improving flexibility, strength, posture and balance. Prevent and reverse the effects of osteoporosis with physical therapist and certified Pilates teacher Teresa Maldonado Marchok. 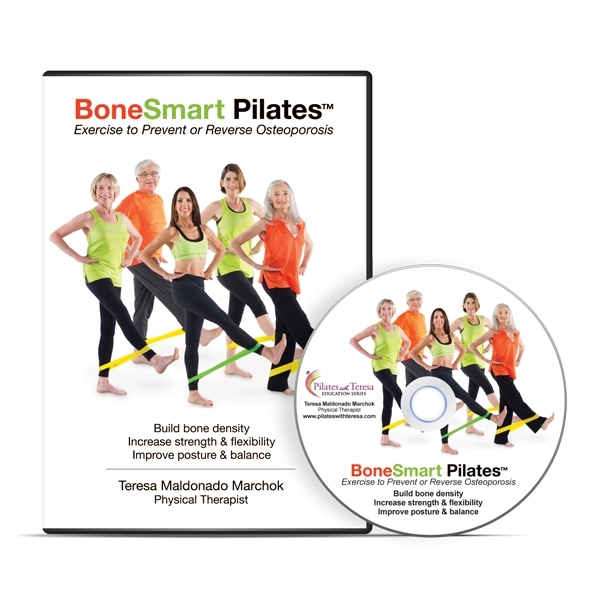 BoneSmart Pilates™ is an osteoporosis-safe exercise program that delivers the benefits of Pilates, like flexibility and core strength, without forward bending or fully side-bending. It features five workouts, covering Pilates exercise on the mat, standing at a counter, with a resistance band, a hip-blasting workout and the energizing Bone Dance. Each fun, osteoporosis-safe workout on this DVD is based on Marchok’s A, B, C’s: alignment, balance and contraction. These are the building blocks of safe and supported movement. Workouts are accompanied by tutorials that detail how to safely perform the exercises and address modifications for all levels of user. Taught by Teresa Maldonado Marchok, MPT. Running time: 2hr 19min. BoneSmart Pilates utilizes affordable and portable props that are available here, from OPTP. November 27, 2013 / Therese C. Taylor, PT, Physical therapist/private practice owner - Newtown, PA. Perfect title--exactly what this DVD is about. Excellent! Well done! Fills a huge need for a huge population! When I tell my patients about Teresa&apos;s credentials alone--they want a copy. I have been practicing manual physical therapy for 30 years and been a student of Pilates now for three years. I love Pilates and love this DVD--packed with worthy and excellent, well instructed, well demonstrated Pilates exercises for a population that needs exactly what Teresa is presenting. A true life--saver, bone saver, much needed DVD. Thank you to Teresa for obviously putting in so much meticulous effort into making every detail of this DVD with excellent patient care in mind.